Amid all the big announcements at this year’s WWDC keynote, there was an undercurrent that was subtle, but important. “It just works.” Steve Jobs kept saying this over and over again on stage. When Jobs does this, it’s never an accident. It’s a message. And it’s a message that was underscored by another word. “Automatically.” Jobs must have said it a couple dozen times during the keynote. Though Apple stumbled out of the gate with MobileMe, and it never really took off (due to a steep $99 annual price point), Apple is now going all-in with their cloud strategy. But they’re not doing it by simply tacking on cloud storage to their existing arsenal of products. They’re attempting to redefine what the “cloud” is. At one point during the keynote, Jobs noted that some people think of the cloud as a hard disk in the sky where you put files in and then take them out. He even took a small shot at red-hot Dropbox. But as Apple sees it, the cloud is something much more. “The truth is on the cloud,” is how Jobs put it. John Gruber correctly called that iCloud is essentially the new iTunes. That is, it moves the digital hub from the desktop computer to the cloud. But Apple is aiming beyond even that. With iCloud, Apple is transforming the cloud from an almost tangible place that you visit to find your stuff, to a place that only exists in the background. It’s never seen. You never interact with it, your apps do — and you never realize it. It’s magic. Compare this to Google, the company perhaps most associated with the cloud. Google’s approach has been to make the cloud more accessible to existing PC users. They’re doing this by extending familiar concepts. Google Docs is Microsoft Office, but in the cloud. Your main point of interaction is a file system, but in the cloud. Gmail is Outlook, but in the cloud. Etc. Meanwhile, another company now largely associated with the cloud, Amazon, has essentially turned it into one giant server/hard drive that anyone can use for a fee. But it takes developers to build something on top of it to give users a product to use. Some are great. But many again just extend the idea of the cloud as a remote hard drive. While the fundamentals are the same, Apple’s approach to the concept of the cloud is the opposite of their competitors. Apple’s belief is clearly that users will not and should not care how the cloud actually works. When Jobs gave a brief glimpse of their new North Carolina datacenter that is the centerpiece of iCloud, he only noted that it was full of “stuff” — “expensive stuff,” he quipped. The diagrams Jobs showed on stage as to how iCloud works were as simplified as possible. Had it not been announced at a developers conference, I’m not sure Apple would have even done those. Instead, the focus would have been even more on the demos. You’re working on a document in Pages on your iPad, you move over to Pages on your Mac, and there it is. It even remembers where you were last editing. You download a song to your iPhone, you pick up your iPad, there it is. And that speaks to the larger game here. Apple has been going out of their way to avoid using the word “syncing” with regard to iCloud. That implies that files exist in one place and need to be moved. But again, even that’s too technical for the story Apple is weaving. With iPad/iPhone and now OS X Lion, you don’t save documents anymore. They save automatically — but an easier way to think about it is that they just exist, as is, in realtime on all your devices. The truth is that they exist on your machine, then on iCloud — again, the “truth” — in a cycle. But you don’t need to know any of that. They just exist. Who cares where as long as they’re right there on all your devices when you need them? Files are something Microsoft worries about. Files in the cloud are something Google and Amazon worry about. Apple’s iCloud is about opening an application and the thing you want to access being there. That also speaks to a key difference between Apple and their competitors. With MobileMe, Apple put a fairly heavy emphasis on the web component. They spent months working on and reworking beautiful web apps for the service. During the iCloud keynote, there was no mention of a web component. For what it’s worth, we’ve heard that the MobileMe apps on me.com will be altered to work with iCloud apps, but that may be a ways off. And that will certainly not be the primary emphasis. The primary emphasis will on the cross-device native apps with iCloud magic. That’s the opposite of Google’s approach — at least their Chrome/Chrome OS approach. That product is only about the web. That’s where everything exists, and syncing also happens automatically thanks to that. In a weird twist, in that regard, Chrome OS is perhaps the closest thing to Apple’s iCloud vision. When you boot up a Chromebook and enter your password, everything appears. Again, like magic. With Chrome OS, everything is always there because everything only exists in the cloud. But Google has been bending over backwards to tack on a file management system to Chrome OS. That weakens their cloud argument, in my view. But again, their aim is to ease the transition of current PC users to the cloud. But Google’s position is especially odd because they have Android as well. Yes, cloud syncing is a big component of that OS and has been for a while. But it’s the Google approach. It’s files, and uploading, and syncing. Some of it is automatic, some is not. It requires some thought. It sort of just works — as long as you know what you’re doing. And the truth is that this is the point where we may really start to see some truly fundamental differences between Google and Apple after the past few years going head-to-head with feature matching. Apple is going after consumers who have absolutely no idea what the cloud is, and don’t care. Apple is saying they shouldn’t care. It all just works. Google seems to be aiming more for users who understand current computing paradigms and want to transition that knowledge to the future of computing, the cloud. Power users, if you will. Many of the people reading this post are in this camp. But there are many more who are not. Apple has rethought and rewritten their apps — including their desktop apps — from the ground up to be woven with iCloud fabric that a user won’t see. Google wants the users to be able to see that fabric if they choose to, and in many ways, encourages it as sort of a safety net in the transition to the cloud. It is two different approaches to the same thing, the cloud. And Apple doesn’t believe that Google can match them even if they wanted to because they don’t have complete control of their ecosystem in the same way that Apple does. 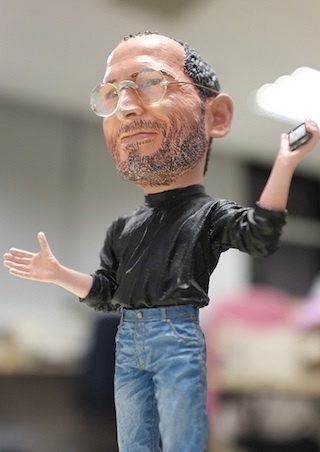 “They can never make this so it just works,” Jobs stated at one point. In Apple’s core vision, there are three types of products that must seamlessly work with one another: phones, tablets, and the recently “demoted” PC. With Android, Google is currently only strong in phones. Tablets aren’t taking off for them yet. And there is no PC presence — well, beyond the web, which again runs into the Chrome OS bifurcation problem. With that in mind, it may end up being Apple that helps transition users to the cloud, instead of Google despite their emphasis on PC norms.